The DPR-22PS is a microcontroller-based dividing pulse relay designed to provide two sets of isolated “dry” 3-wire Form C contacts (K, Y, & Z) from a field selectable 2-wire Form A or 3-wire Form C pulse input which have been divided by a user-selected number. The divider’s ratio of input pulses to output pulses may be set between 1 and 255. Selection of the desired division ratio is by two small selection switches mounted on the relay’s board and is easily adjustable with a small screwdriver. 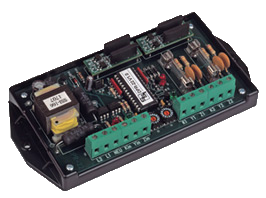 The DPR-22PS microcontroller checks the input pulses for the correct sequence and timing, and counts the input pulses for division only when a correct and valid sequence of pulses occur, thus assuring a high degree of noise rejection. Two sets of bright red and green LED lamps indicate the input and output status of the system at all times thus allowing a rapid visual check-out of the system’s performance without requiring any additional test equipment. The input and output circuits’ terminal strip are “Euro” type connectors. The K leads of each of the DPR-22PS’s isolated outputs are fused to prevent damage to the relays under almost any condition a user might subject it to such as excessive current, voltage, or incorrect wiring. The DPR-22PS provides a “pulled up” sense voltage of approximately +13 VDC on the Y and Z terminals of the input to the external sending contacts. The K terminal is system ground allowing the use of standard electro-mechanical, dry contact switches or solid state open-collector transistor MOS-FET pulse initiators. 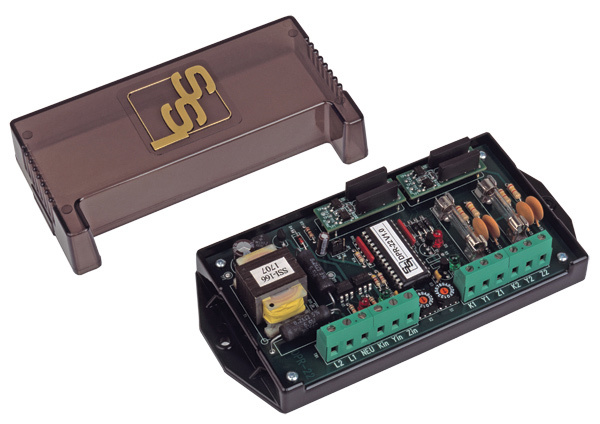 The DPR-22PS has built-in MOV transient protection for the solid-state relay contacts that eliminates the need for external or off-the-board transient suppressors. All component parts of the DPR-22PS, which have power applied to them with the exception of the input/output terminal strips and the divider switches, are enclosed in a polycarbonate cover for maximum user protection. The mounting base plate is also made of polycarbonate and offers excellent electrical insulation. The DPR-22PS is intended to be mounted in an enclosure appropriate for the application and the operating environment. Pulse Input Voltage: +13VDC “pulled-up” on Yin terminal. Common return is Kin terminal.